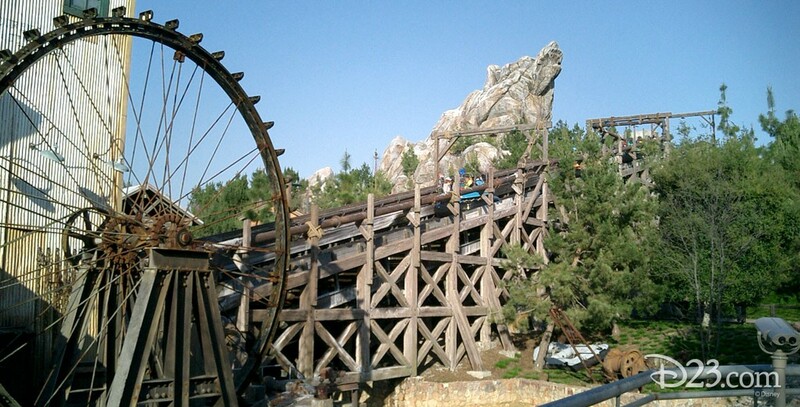 Grizzly River Run Attraction, appropriately nicknamed “Grr, ” at Disney California Adventure; opening on February 8, 2001. Up a clattering 300-foot-long gold ore conveyor, eight-passenger rafts are lifted into swirling rapids 45 feet above the valley along one side of the 110-foot high Grizzly Peak, the icon for the park. More than 130,000 gallons of water a minute roar down the river flume, carrying guests on a wild and thrilling, and, yes, wet journey.